First to sum up the 4 previous books. Back in 1991 wrote 4 books – the original Vampire Diaries; The Awakening, The Struggle, The Fury and The Reunion, which are basically about vampires, eternal love and devoted friendship. I read the first two in my early tweens, but never got hold of the others and I didn’t find the entire quadrilogy till January 2010 where I reread them. Book 1 and 2 had me wondering why I had liked them so much, book 3 I thought was a decent end to it all, and then came book 4 and destroyed the whole thing. An utterly mind-baffling resurrection of something that would have worked just fine as a YA trilogy, book 4 kept a book series alive that had served its duty and deserved peace. Now, to be clear, the trilogy I think is good. The writing was a bit weaker than I remembered but still enjoyable. The 4th book seemed a bit redundant, but I went along with it though I had the nagging feeling that it was written only because the author couldn’t bear to say goodbye. So onwards to 2009 where book 5 suddenly appeared. 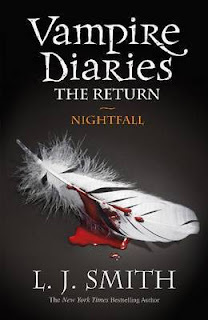 Called The Return: Nightfall the story picks up a few days or weeks after book 4 ended and to be perfectly honest with you, the book is an utter mess. It was impossible to make sense of what was going on and jumps from one thing to another, and changes point of view quicker than a cheetah can run. It is often difficult to discern who says what and just to add to the general confusion, there are new villains at play. These are some obscure Japanese characters/demons who mostly just gave me the feeling that Smith has recently become a fan of animes and just *had* to include something from that genre as several of the characters have also suddenly taken to using Japanese expressions whenever they can to support the thinner and thinner plot. The character development in the book is horrendous and only Elena actually has something beneath the surface, little as it may be – the rest aren’t any deeper than the paper they’re written on. The love both brothers have for Elena and their different ways of handling just seems like a joke by now and the thought, that some youngsters will grow up with these books believing this is how love works, makes me cringe. Overall I was disappointed by this book, but at the same time I never set my expectations very high for it. The writing feels weak and it’s just too much. To drive home my reason for only giving this book 1 star, have another quote from it. This might be so bad I just have to read it out of curiosity.... I recently read the first four after falling in love with the TV series and was quite disappointed. I totally agree. I really liked the first 3 books when I was younger and the first season of the show was kind of my guilty pleasure but I tried reading the 5th book and had no idea what was going on.